Hello!! And Welcome to the 3rd posting of the Remarkables Blog Tour!! I hope you are enjoying this… I sure am. So, Today is about Valentine’s. Or any other event you’d need LOTS of hearts. I have to admit. I first saw this stamp set and didn’t give it a second look. 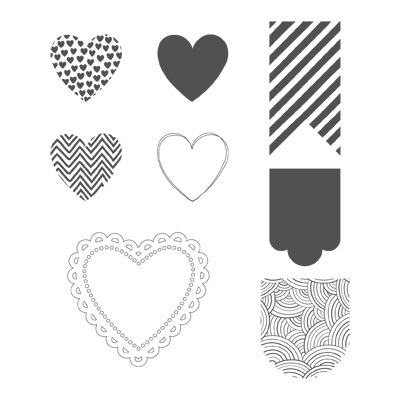 I have heart stamps. But, then when I actually PLAYED with it, I fell in love. And, here’s why: It’s got matching Framelits. 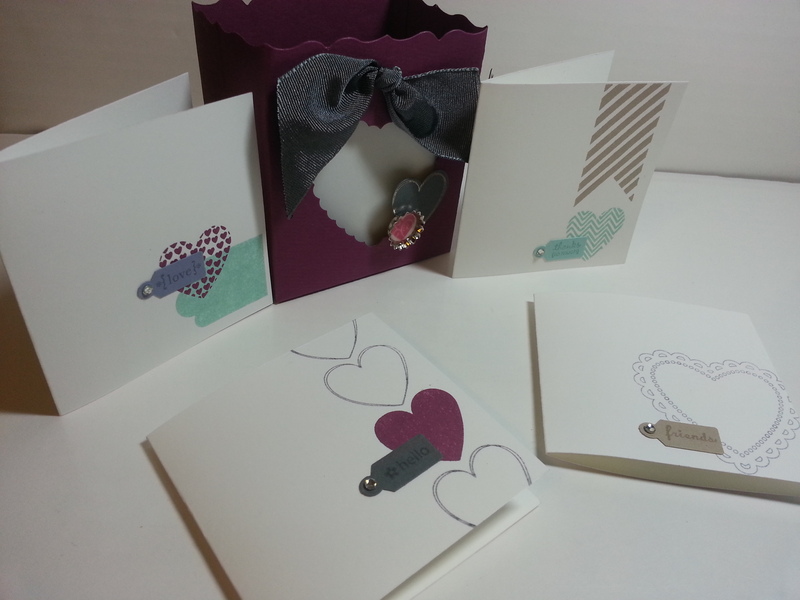 AND, the heart is the same size in but with different stamps. I like that I can have the same size of image in many different ways. And, I am a teacher, so I had Christmas Vacation to play a lot with this set. It has quickly become a favorite of mine from the Occasions Mini. Needed a little of inspiration, I took to pinterest to find a color challenge. 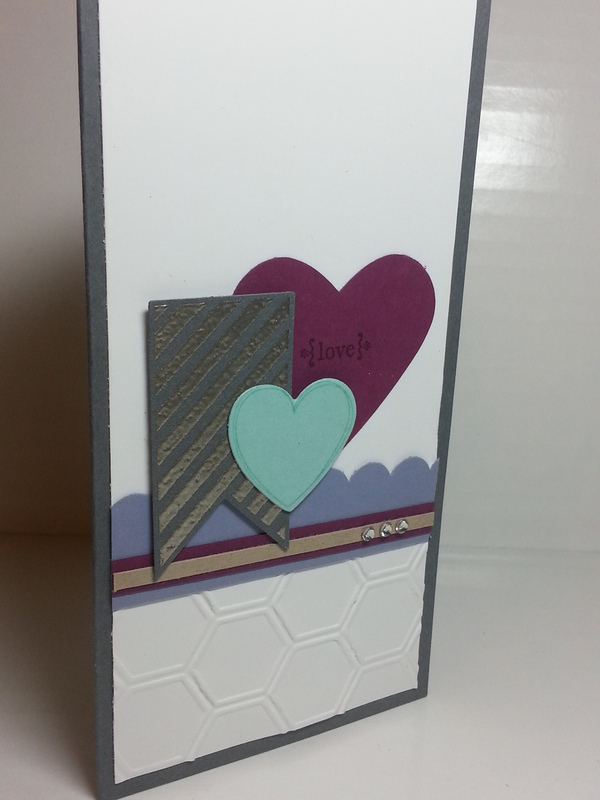 This one was a fun one… Rich Razzleberry, Pool Party, Basic Gray, Wisteria Wonder, Whisper White. I gotta say, Pinterest is the creative jump-start… And here is what I came up with. 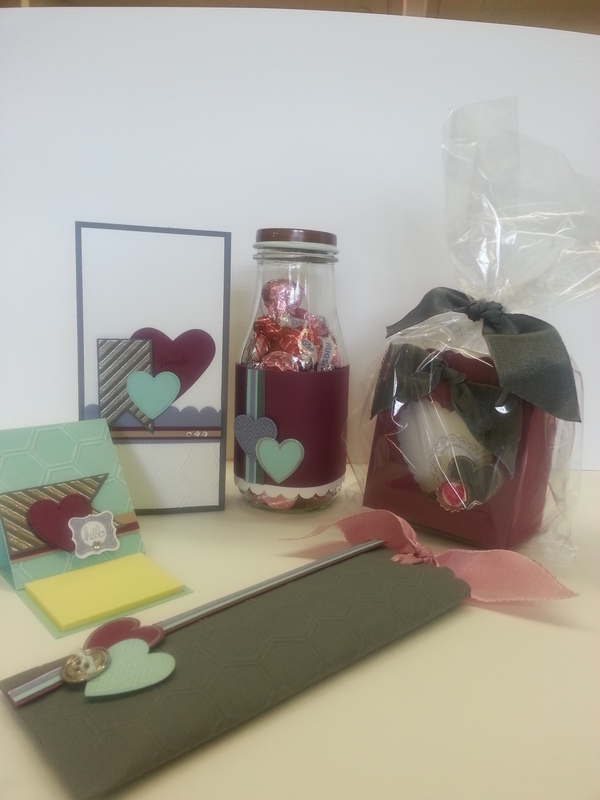 I kind of wanted to do a SUITE of different things… for all the different people you need a little gifty for on Valentine’s Day. 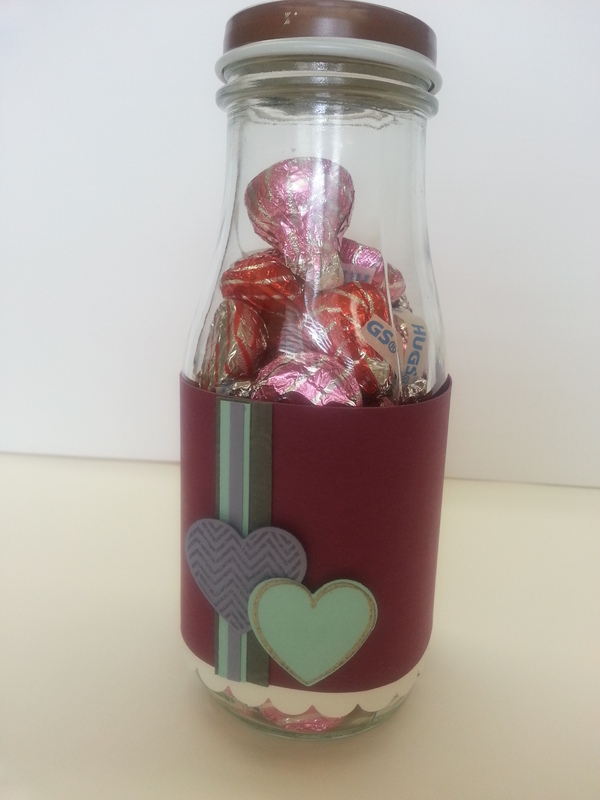 Next we have the gift to our BESTEST FRIEND… (who always appreciates a good hug–both the human and chocolate variety)… The Up-cycled Starbucks Frappachino Bottle filled with a Hershey’s Hugs. 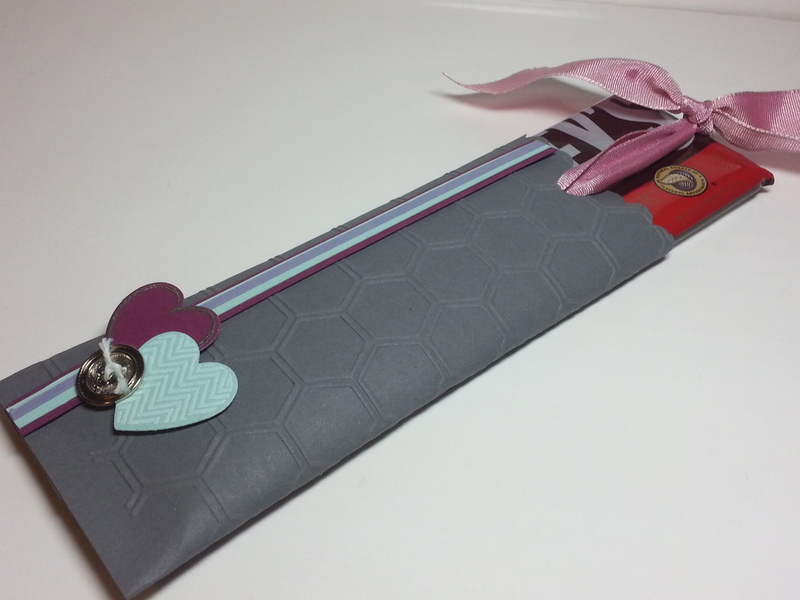 And here is the package without the chocolate, so you can see how to put it together. Punch a hole in the TOP LAYER ONLY of your pocket (and to make the pocket, I just cut card stock a little longer and wider for it to wrap completely around a chocolate bar…or WHATEVER… but this teacher likes chocolate… dark chocolate). Thread ribbon through it and around a chocolate bar, and tie. There… It will slide in and out… And BTW… I lied again. 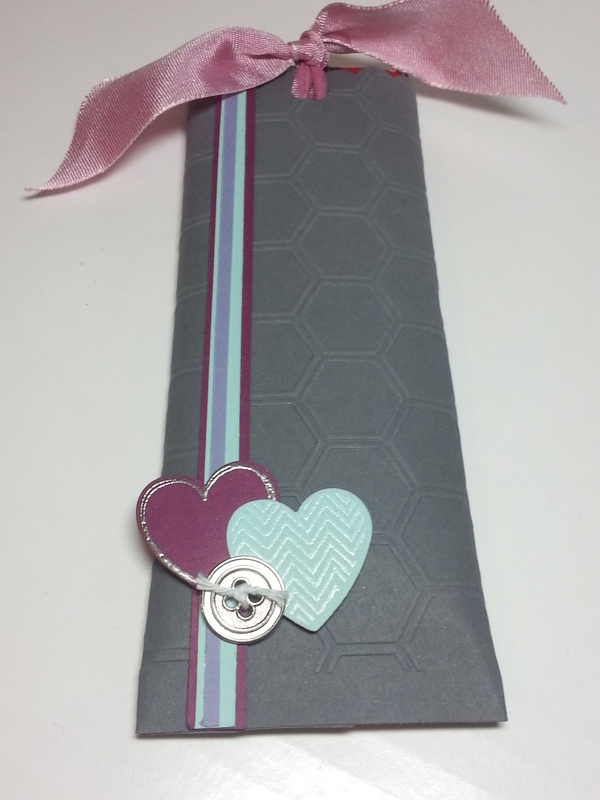 The Two Toned Ribbon may be my favorite item. Well… I CAN’T DECIDE ON A FAVORITE. This is a close up of the front of the box. 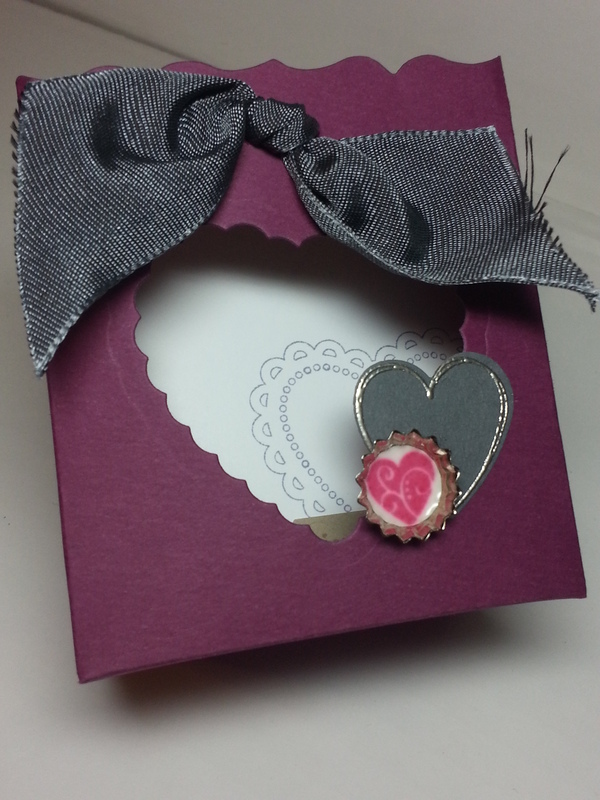 I used the framelits heart to cut out the heart shape and the new soda caps with crystal effects to add that little detail… These look great packaged in our gusset cello bags!! 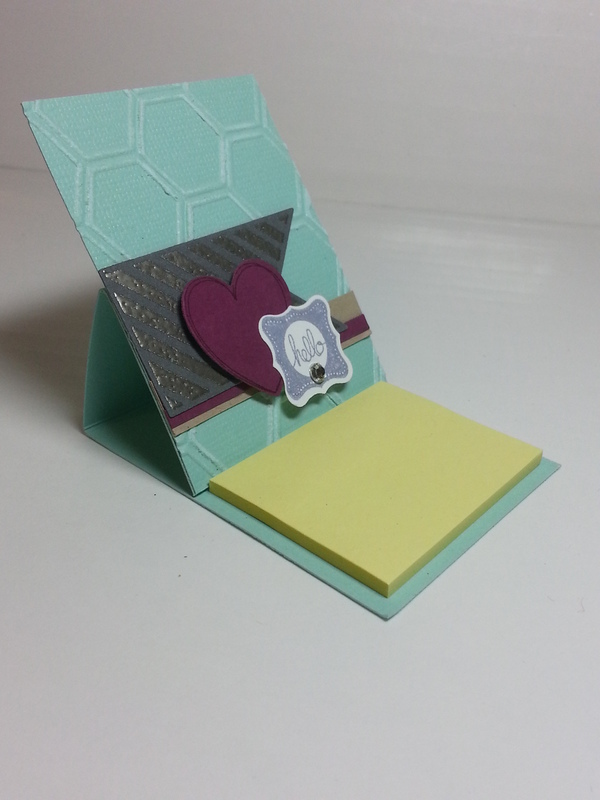 And next we have the little post-it easel. These are GREAT for the co-workers. Fast and EASY to make and they are very cost effective as they don’t use a WHOLE pad of post-its. It will brighten ANYONE’s day on Valentine’s. You invite the people (and if you need a space. talk to me) and we will make a pre-determined project. 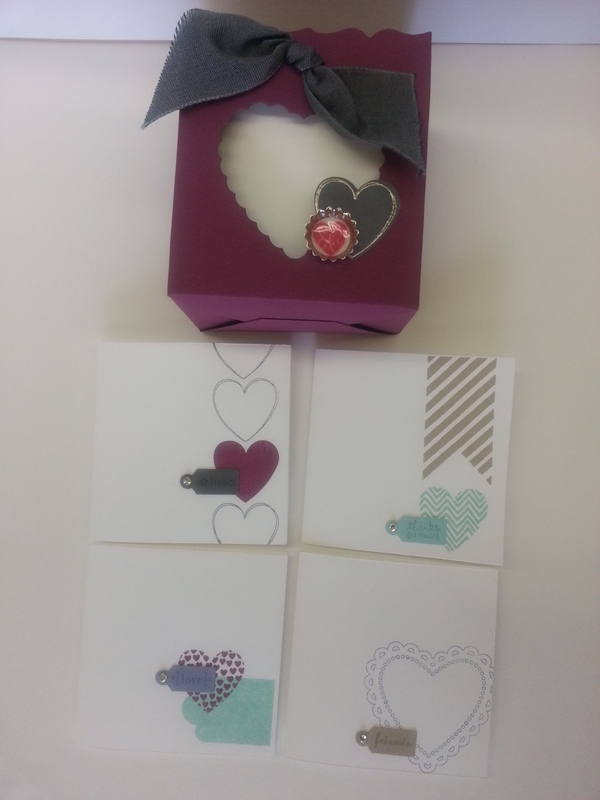 This month, it is the Heart’s A Flutter Mini Love Note Box (see photo below). Everyone pays $5 to make the project. End of story. That way, this includes the people who just like to ‘hang out’ but aren’t stampers. 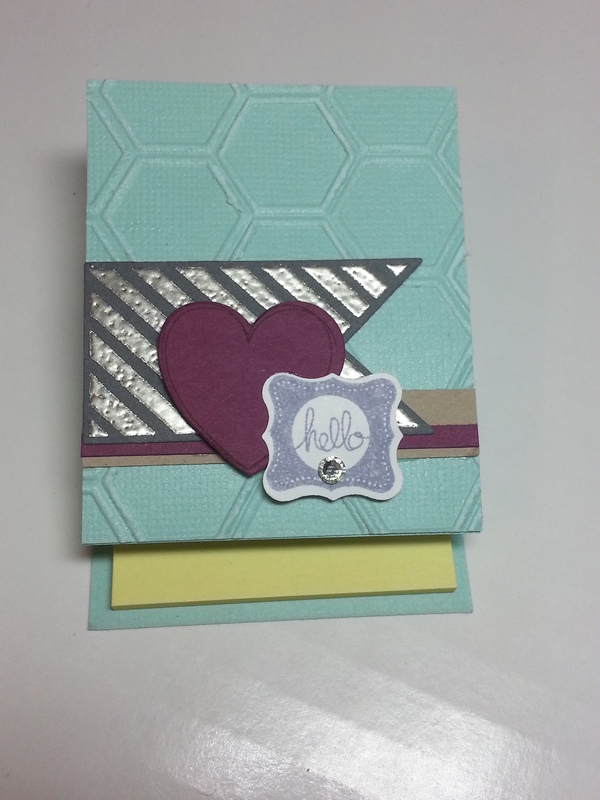 It is a fun, enjoyable time and we get to craft together. Now, should people decide they need to place an order, because they had SO MUCH FUN, they can have their class fee refunded (if they place at least a $30 order). AND, as the host of the private class, you would get to collect the hostess benefits. And, don’t forget about January 13!! Okay… SO here is another glimpse at Sale-A-Bration. 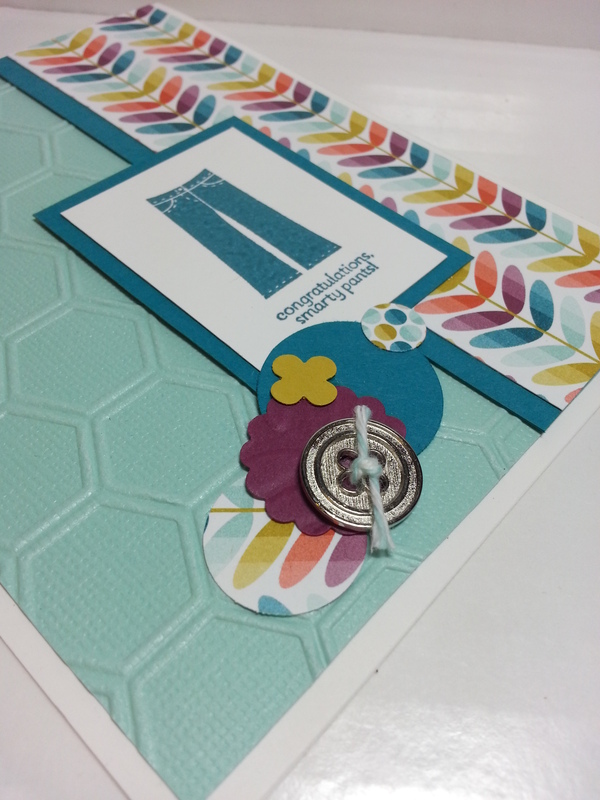 This cutie comes from the Patterned Occasions Sale-A-Bration set. I love it. It seems so suited for a teen or tween girl who excels at something and you just wanna give an “‘atta girl” to… I can see using it for graduation.. Possibilities are endless. And, this isn’t the only stamp in the set!! You will have to stay tuned for more.